Cultural Enabler of Continuous Improvement. Improve your organization with a simple piece of paper. An employee suggestion form gives your employees the opportunity to make suggestions and give valuable feedback. They can continually encourage employee suggestions and, when great ideas are implemented, can continue to improve your organization. If you have an employee suggestion program in place, an employee suggestion form is a key part of collecting ideas from your employees. Create an employee suggestion form to encourage your employees to submit suggestions. Focus. Keep in mind that the goal of your employee suggestion form is to receive your employees’ suggestions to improve a certain aspect of your organization. You want to know what an employee’s suggestion is and how it can improve your organization. Ask general questions and include categories (improve customer service, save costs, etc.) to direct idea generation. You can find a template for an employee suggestion form at the end of this post to use. Keep it Simple. Your employee suggestion form should be easy-to-understand and quick to complete. You don’t want to discourage your employees from sharing their suggestions because your form is lengthy and complicated. Use language that’s familiar, keep questions simple and open, and use a form that’s simply designed and easy-to-follow. Give Employees Room to Think. 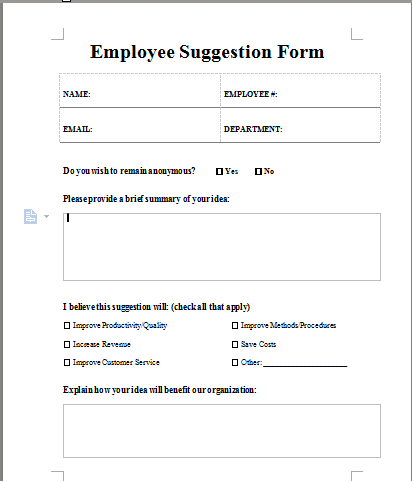 Provide enough space on your employee suggestion form for your employees’ feedback. A small amount of space can make employees feel constricted to only using a few words to describe their ideas. Enough space will encourage your employees to talk more about their ideas and think about the potential benefits for your organization.